Russia ; the Glorious Champion! 2009 World Under-16 Chess Olympiad which is organized in a small and cute town, Akhisar, has unfortunately come to an end like every beautiful thing… Russia, the heavy favourite before the start, has proved herself once again as the motherland of chess and finished the Olympiad first with 30 points although her road to the cup hasn’t been very smooth. India, her main contender, took the leading position right from the first round and seemed like she was coasting slowly to victory but an unexpected defeat by Armenia in the 9th round meant an end to their dreams of championship and settled for the second place instead. Armenians, a nation who has presented and still presenting a number of very strong chess players ( and even world champions like Petrosian!) 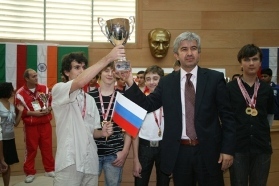 to the world chess scene, could be proud to decide the first and take the third place. Congratulations to all of you guys! The other teams from all over the world like Sri Lanka, Republic of South Africa, Turkmenistan, Libya or Uzbekistan has competed ambitiously and fought hard to take points in a fair manner. There were also countries which established themselves as chess countries in the history such as Hungary, Azerbaijan, and Georgia. We are grateful to all the participating teams for coming. Special thanks to Sri Lankan, English, Greek and Turkish boys and girls for their entertaining performances on the free day. If you haven’t seen it yet you should check the photo gallery definitely! 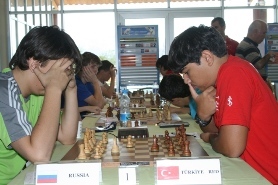 Hope to see all of you in the coming World Youth Chess Festival, 11-23 November, in Antalya! Undefeated Leader India has beaten by Armenia! Round 9 has staged very surprising scores. Undefeated leader of the tournament, India, gave up 2,5 points against strong squad Armenia. 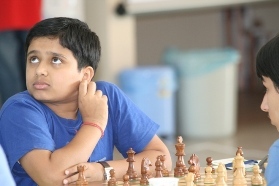 In the clash of two masters at first board, GM Ter-Sahakyan beat his opponent FM Priyadharshan with a nice game. 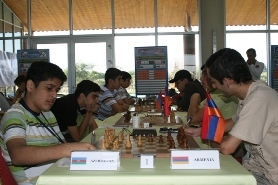 This ambition continued also at third and fourth board of Armenian team and at the end they got 2,5 points from one of the most strongest team in the Olympiad. Also with this score, Armenia move a step forward on the fight for 3 seed. At second table, proud victor was Russia against Turkey-Red. No wins, but a draw registered at Turkish side. Great performances coming from Russian team at round 9, brought 2 points advantage over India. 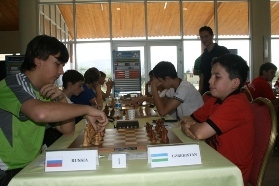 If Russia’s fine weather will continue for last round, they will be the champion of the Olympiad! We are waiting for tomorrow, 10.00 am to see the final battles. 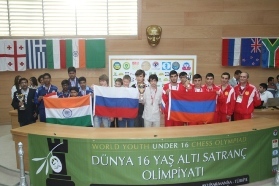 World Youth Under 16 Chess Olympiad is slowly approaching the end. But still it seems difficult to make predictions about first three seeds. Draw between India and Russia continued after round 8. They both got 2,5 points from their opponents Hungary and Turkey-Turkuaz. At the beginning of round 7, there was another fight between Hungary and Armenia to get third seed. Unlike the previous one, this time equality broke down on behalf of Armenia. However a bombshell is waiting for Armenia now; India! If Armenian squad can manage to win his opponent India at round 9, first three seed going to change. Lets wait for round 9 at 16.00 pm and see! Russia Joined India at the Top! Thanks coming after free day, round 7 witnessed heavy weight matches. Having almost 1,5 day-off gave enough time for players to prepare strong openings and increase their motivation in the tournament. There was a tough test for the favorites India and Azerbaijan at table number one. Azerbaijan tried to close 1,5 points gap against India but couldn’t achieve. Perfect performances of Indian players at second, third and fourth board resulted in 2,5-1,5 score on behalf of India. At second board, 4-0 whitewash of Russia against Uzbekistan was the brightest score of the seventh round. Thanks to this score, arch-rival Russia joined India at the top with 20 points. Similar attractive came form third board. The defeat of Georgia in the hands of Armenia was a noticeable result. Armenia gave up just one draw out 4 games. Round 8 is going to start at 10.00 am. Winning Streak of India is Stopped by Russia! A Brief Look at the 4th Round! 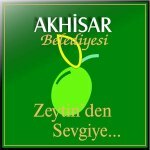 Armenia: 2 - Turkey Turkuaz 2 ! !